Neil Warnock in his Leeds United days and now set to be in charge of their opponents, QPR. After losing out to one old boy current Leeds United boss Steve Evans could be haunted by another this Saturday when the Whites travel to play QPR in the Sky Bet Championship. Neil Redfearn got one over his previous employers when Rotherham United left Elland Road with all three points from a 1-0 victory last weekend and now Leeds go up against a QPR side in the hands of former United bosses Neil Warnock and Kevin Blackwell on an interim basis. If the London club does make an appointment of a permanent new manager by the weekend it could be another ex-Leeds player in Jimmy Floyd Hasselbaink, who is currently favourite to take the hot seat following Chris Ramsey’s sacking. Whoever is in charge they will be facing a Leeds team smarting from a poor display and a bad defeat against bottom of the table Rotherham. Missed chances were the main reason for the narrow defeat with Mirco Antenucci putting two great opportunities wide of the mark, Chris Wood failing to get enough power or direction behind a close range header and Luke Murphy being too slow to get a shot away after going clean through. Alex Mowatt was also denied by a fine save from keeper Lee Camp so the case can be made that the Whites would have been worthy winners, but their football left much to be desired and the direct style demanded by head coach Evans and now being played by the players has left him open to criticism. Playing this way and getting results will always be accepted by fans, but not when results go against the team. Evans’ record so far of two wins, two draws and two defeats – both at home against distinctly average opponents – is not much better than his predecessor’s and unless a quick improvement is found he will not last much longer in the job, whatever assurances he says he has been given by Massimo Cellino. Big tests now await with QPR still possessing many of their Premier League players and the following week’s opponents, Hull City, flying at the top of the league. To be fair to Evans, he has had to work so far with players he did not sign and he will be hoping to have at least one new player of his choosing to call on before the next game with the loan transfer window about to close tonight. Leeds have been linked with a number of players, but the priorities will be an extra striker as they are short up front now they are employing two out and out forwards every game and another defender with the Whites possibly without three for the QPR trip. 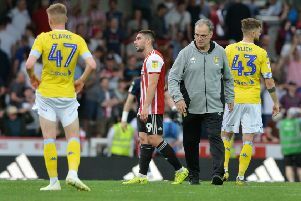 Sol Bamba has a toe injury, Charlie Taylor is still recovering from glandular fever and Gaetano Berardi is banned for two games following his red card against Rotherham when he reacted angrily to having his nose smashed by a nasty challenge by Leon Best, pushing the Rotherham player to the ground then tangling with a linesman after initially refusing to leave the pitch. After the game Evans was hopeful of bringing in additions to his squad this week, but not certain. He said: “I think I said I would be disappointed if we didn’t. But I said I’ve been disappointed at Rotherham when we didn’t sign certain players at certain times.